Alhamdulillah, by middle of December 2015, I have finished studying Book 1 of Madinah Arabic by Dr. V. Abdur Rahim, downloaded from LQToronto website. By now, I am in the midst of revising Book 1 of Madinah Arabic by strictly completing one video per day following the Youtube videos done by Brother Asif and the rest of the team from LQToronto. May Allah bless them and reward them with Jannatul Firdaus for their deeds. Amin. Well, I am just finishing Lesson 5 today and I have another 13 videos to go. Each video ranges from 2 hours to 3 hours. I hope to finish all of them by the end of this month. Insha Allah. The reason why I decided to review the videos is because I might miss precious tips and knowledge from the teacher; Brother Asif. Masha Allah, he is a great teacher and I have found his explanation of the Madinah Arabic very easy to comprehend. Another reason is because I want to ensure that I have the best understanding of Book 1's grammars and have solid foundation before moving forward to Book 2. Insha Allah. 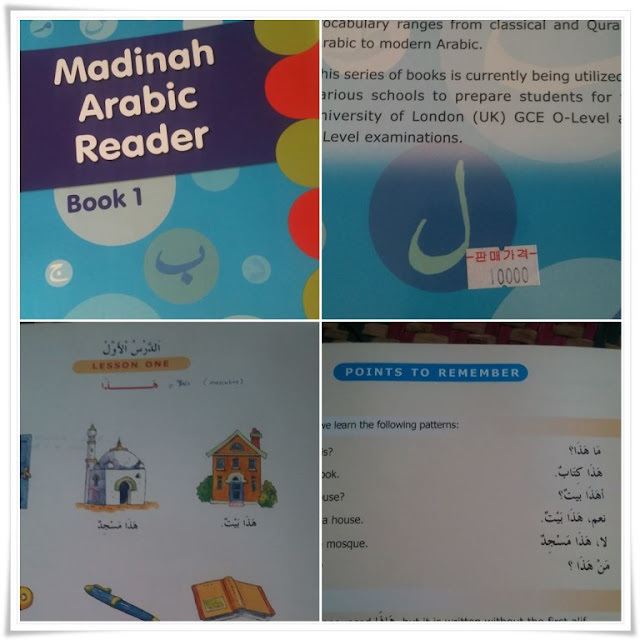 I have been looking for many resources for learning Arabic but at the end of July, 2015 I finally found the right resources and teaching method from LQToronto. Alhamdulillah. There are a lot of procrastination on my part on learning Arabic because previously I thought Arabic is a very difficult language and well it is still now but I have been discouraged mainly by many remarks of the people around me saying it was difficult for them. However, quoting from the teacher, "Learning Arabic is very difficult for lazy people". That is indeed very true because I have no one to blame except myself because I was lazy to learn! "I feel that if I show you how to do simple analysis now, then in Book 2 and Book 3 and then when the Quran will come in front of us, you will understand it beautifully. Directly! That is our aim, to understand Quran directly in Arabic. The Quran has to be read in Arabic and understood in Arabic. The miracle of the Quran is the language of the Quran. Message of guidance is there but how the message brought down is a miracle. Allah SWT in His infinite wisdom give Prophet Muhammad SAW a miracle that will remain miracle till the end of time and if you don't know the language you will never feel that miracle. It is up to you. As a non-Arab, we must make an effort and Allah will make it easy on us." 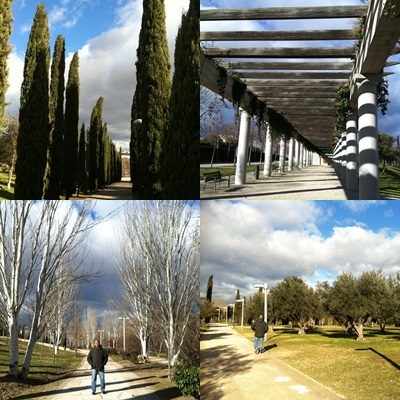 Madrid definitely has many beautiful parks and we frequently spend our time at one of the parks to just laze around. 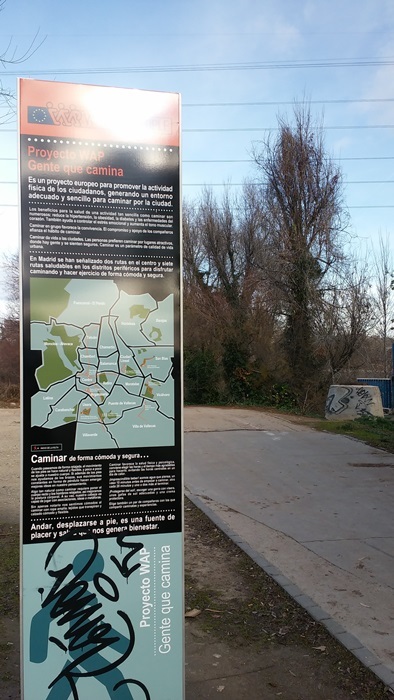 Although we love, love, love Buen Retiro Park but we often go to the one nearest to home, Manzanares Park or if you say its name in Spanish, it will be Parque del Manzanares. Well, on the day of Los Reyes Magos and we felt like doing some exercises albeit in our separate way. Me, by brisk walking and my husband with his bicycle. I went out of the house first, of course! Yesterday's weather was quite chill! I went out at a quarter past eleven in the morning and by the time I reached the park,it was close to 12 noon, hoping the winter weather to get warmer but that was not the case. Brrr...should have put on the muffler. My phone checked at 6 degree celcius. 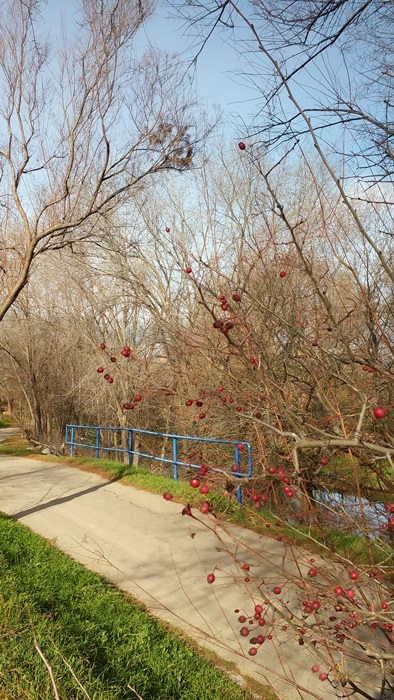 There were many people running along my way to Manzanares Park. I have never fancy running just because my knee will act up after hitting the course. Brisk walking is better. I just followed this small road and the small stream is so lovely, adding up to the already marvelous view. Subhanallah. 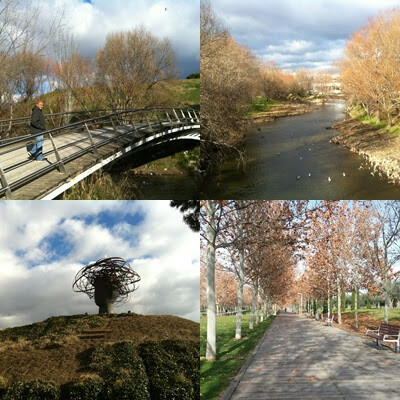 Manzanares Park is so big, spanning around 650 hectares and the park is actually part of a bigger park project using Manzanares River as its backbone. So, the stream you see in the picture above is actually coming from a bigger river called Rio Manzanares in Spanish. I took the picture (autumn tree) towards the end of December 2015 and it seems the autumn ends pretty late this time. 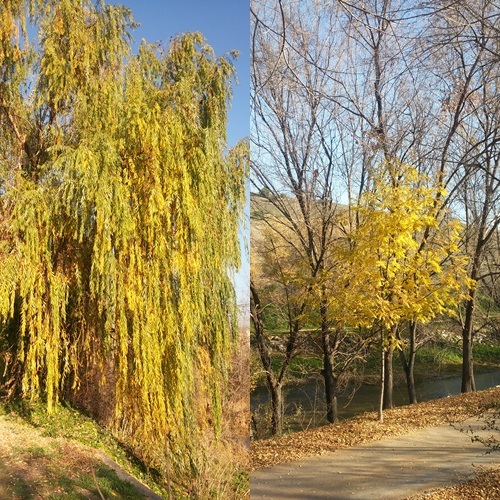 The yellow leaves contrasting the lovely blue Madrid sky. Breathtaking. 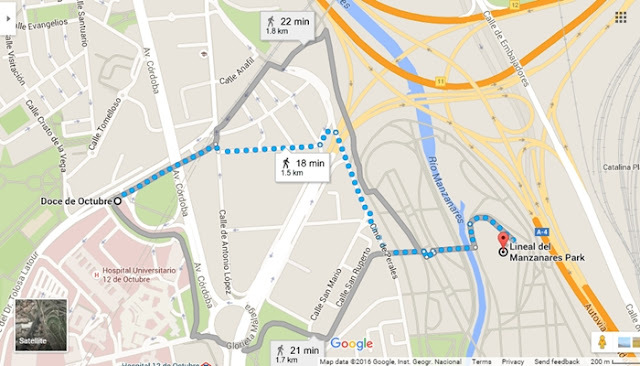 It took me about 45 minutes walking from my house to Manzanares Park and the journey is about 3.4km. Return journey is close to 7 km! Yeay! In the spirit of physical fitness but only done once or twice a week..kekeke. How to go to Manzanares Park? Can you really get some wisdom in a day of flight from the other persons you met either at the airport or inside the plane? Can it get much better than that? Have you ever give it a thought about the power of du'a or do'a or prayer of a traveler and how in a day of travelling, I have been asked not once but twice by strangers to make du'a for them? Allahu Akbar. Well, I find that my whole journey this time was quite an interesting one and just cannot wait to write it down for myself to reflect on for years to come. Let's hear it, my soul. I took an Etihad flight from Kuala Lumpur to Madrid with a short 2-hour transit at Abu Dhabi. It took me approximately an hour to reach Kuala Lumpur International Airport by car from my brother's home and I gave myself an ample 2-hours before the boarding time at 1920 hours. Well...right before taking the shuttle train to the other terminal for my flight at Kuala Lumpur International Airport, I met an old lady around the age of my mom, maybe mid 60's. She was lost, left by her group, alone, to find her boarding gate. She was going for umrah, not with a travel agent but rather on their own. She told me that, this is definitely a test from Allah. Hmm...it made me think. Why? Because she told me that she has done this so many times before, meaning going for umrah without a guide but just see at herself now, she was lost! Plus, right after we alighted the shuttle train, I definitely brought her to the wrong gate or so I think! I thought I was heading for the right direction but I missed the 'correct' arrow for the boarding gate. My eyes were focused only at the numbers but not the arrow hence I unintentionally gave her unnecessary fatigue to her old self. Pity her. She told me that she will not complain as she has found her guide (albeit towards the wrong direction and I was really sorry for that!) and she was grateful to Allah for that. She told me umpteenth times that she was definitely being tested by Allah! At that moment, looking at her; my heart instantly prayed for her. O Allah, make it easy for her. I purposely chose the seat 19C, aisle for both of my flights which is situated before the wing and a few rows behind the seats where the babies are usually seated. When we started boarding the flight, I thought this time the flight was quite empty with plenty seats available if I decide to move behind later. Even the couple behind me said, "They (the airline) told me that the flight is full but it is clearly not!" But...a few minutes later, throngs of umrah group started boarding and true to the airline's statement that the flight is indeed full. Initially, the person seating next to me was the leader of one of the umrah groups - Juara Travel & Tours. I sensed his uneasiness and a few minutes later he asked the stewardess for a change of seat. Alhamdulillah, a lady agreed to exchange the seat with him. This lady (under the same umrah group) made me tip my hat off to her. She's a widowed mother with seven kids. When she was 40 years old, her husband died of a sudden heart attack. Masha Allah, she continued her life with her kids with perseverance and supporting them by selling foods from the van. She is closed to 60 now. When she told me that was her first time boarding a flight in her life EVER, I was brought back to my experience of taking my first flight alone. The difference is that she is invited by Allah to perform umrah but me, I was going on my own to Japan but also in a search to become closer to Allah. Different cities but with the same intention. Allahu Akbar. She was clearly anxious and full with questions about her first flight experience. Subhanallah, Allah gave me this opportunity to assist her. A guest of Allah to Masjidil Haram and I pray that I will step my feet there one day too. Amin. I showed her how to use the monitor installed at the back of the seat, how to leverage her seat, how to use the restroom, what food to choose from the menu given by Etihad, so on and so forth. The moment the flight started its engine, she trembled slightly, was clearly anxious but smitten by the gorgeous light display on the land once it took off. After taking numerous flights, I find my experience is only like a dull cycle but looking at her beautiful self, I am just so so grateful to Allah for giving me this chance to calm and guide her. and said our goodbyes when we departed for our transit flight. Mine for Madrid and she for Jeddah. My flight has about two hours transit in Abu Dhabi airport. Since my flight from Kuala Lumpur started at 1920 hours, I was not able to perform Maghrib prayer in Malaysia, hence I decided to perform jamak takhir and qasar at Abu Dhabi prayer room. what she would like me to ask Allah. She needs guidance from Allah as of that moment she is at lost. Right after our conversation, I stood up for a hajat prayer and in my du'a I asked Allah what she requested for. By the time I finished my prayer, she was no longer there, in the prayer room. I was deep in thought. A stranger asked me to make du'a for her. Title: Dua, the weapon of the believer. You may download the book for FREE, here. In his book, Chapter 8, Page 138 - Conditions during which Du'a is answered - The Traveller. the du'a of he who has been wronged, the traveller, and the du'a of the father for his son"
Narrated by Abu Dawud, Al-Tirmidhi and Ahmad and authenticated in Sahih al Jami. 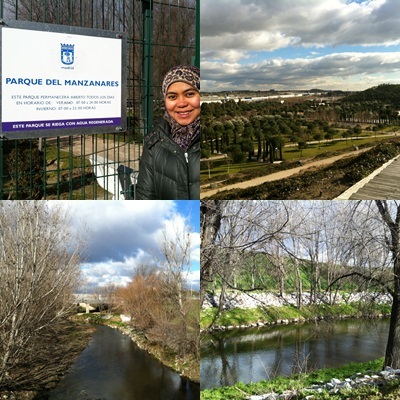 Are you Malaysian?...and from that moment until the plane touched down in Madrid we just kept exchanging ideas about our family life and how we both want Islam to be the guidance. He comes from a well to do family with an acclaimed business in Pakistan but finds himself a slave to the material rat-race. He told me about his plans to change all that and his goal of 2016 is to bring all of his family members to live in Madinah. Allahu Akbar. What a noble intention! Right before our flight touched down to Madrid, he gave me his business card and told me,"Please... do not forget to make a du'a for me and my family in your prayer". Yet again, another stranger asked me to make a du'a for him. Ya Allah, please guide me, my family and all the people around me to the right path. Amin. The power of du'a. A du'a, a simple plead to Allah with a sincere intention. May Allah accept our ibadah. Amin. I have written about Costa Coffee when I visited United Kingdom at the end of 2014 and I seem not to have enough rants to rave about it yet. Well, I do not have any barista experience but as my favorite type of cup, it is cappuccino. My taste bud always..always try to find the best cappuccino around the neighborhood. I love my cappuccino smooth but with a surprise strength of bitterness. Recently, right before new year we stepped out a bit to the center of Madrid to enjoy the crowd. Well...actually, I want to visit Primark actually. Yes...a brand from Ireland but I have shopped a few times in the UK. I love shopping at Primark because there are so many options of affordable clothes and most importantly, they have my size. Well, Christmas was over so I thought that people will not shop crazily afterwards. However, that wasn't the case!! So much crowd in Sol, Gran Via, Plaza Mayor, Callao, Fuencarral and other streets around them. Here in Spain, according to the tradition...Papa Noel (the name of Santa Claus in Spain) does not give presents during Christmas to children. They will get theirs on another special day which is on the January 6th every year. Plus there will be a lot of REBAJAS the first week of January every year. Hence, the crowd and shockingly, we had to queue up a whole block to take our numbers to enter Primark. Yes, numbers! Seriously? We just had to shake our heads here and move on to none other than Costa Coffee cafe'. Initially, I did not recognize the cafe' because of the construction going out just ahead of the building but I saw a signboard next to a small shop right in front of Cine Callao and my curiosity peaked. Costa Coffee? Here, in Madrid? When? And why did I not see the cafe' before when I had walked through these alley before? When asked when Costa Coffee Madrid is opened? The barista said around February of 2015. Wait..that is almost a year! I love the interior design of the cafe', they have selections of cakes (tartas), biscuits and they also sell the Costa tumbler like the one I bought at Costa cafe' of Cheshire Oaks Designer Outlet. My cappuccino priced at 2.70 euro per cup and my husband's espresso at 1.70 euro per cup. 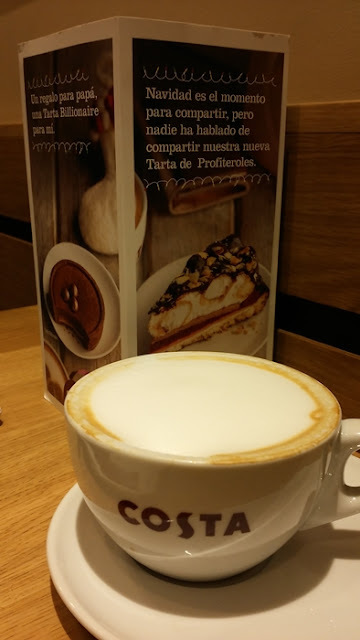 We normally drink cafe' con leche, the normal coffee at the local cafeteria around Madrid and the cheapest is around 1.20 euro per small glass. Is Costa Coffee pricier? You bet. However, you cannot beat the ambient, FREE WiFi and of course the all around coziness of the cafe' itself. If you want to try a cuppa, head to this cafe' which is situated at Calle Preciados, nº 27. 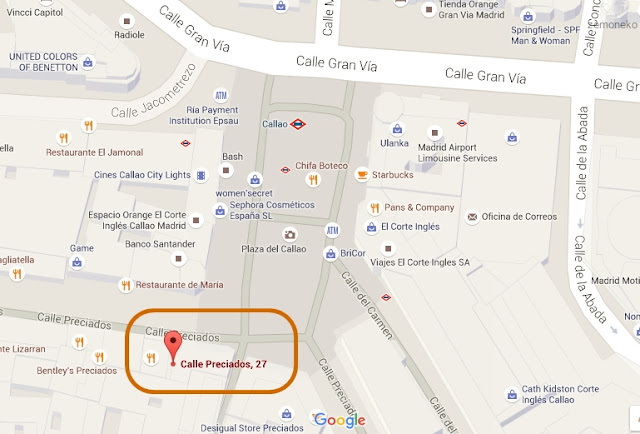 You may take the metro to the nearest station either Callao or Sol. السلام عليكم, Friday Mubarak and Feliz 2016 everyone! Feliz is in espanol and it means happy!! 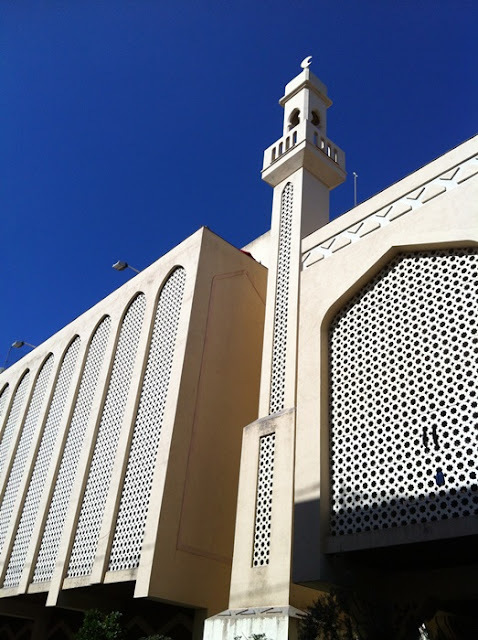 As usual, this year I pray to Allah that all of us will be blessed with good health, sufficient wealth, improve our life by increasing useful knowledge, strengthen our silaturrahim with respective spouses, family and the people around us better and to appreciate all the blessings that Allah has showered us all. Amin. I have not set much of a goal for myself for 2016 except for one - to complete my Arabic language studies by the end of the year to primarily understand Al-Quran and in general my worship to Allah better. Insha Allah. Well..lets make every seconds of our life worthwhile, shall we? 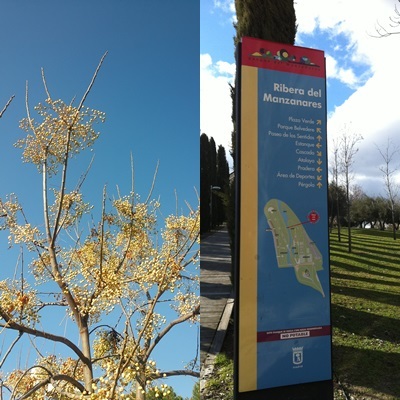 It has been pretty dry but not as cold as last year's winter here in Madrid, IMO. Today, I woke up at 4 am due to the loud cheers outside our home by the teenagers celebrating the new year, everywhere people shouted - Feliz 2016! Of course, our sleep was disrupted but lets be positive, it means Allah has asked us to do some tahajjud right? May all of us is guided by Allah in whatever we do in this world. Amin. Fajar prayer is quite late here now in winter. In Madrid, it starts at 7 am and the sun rises at 8.37am. Well..lately, Madrid's sky has been overcast and somber which reminds me of UK's weather in general and the pretty blue sky which is the usual here has been pretty scarce in the last week. 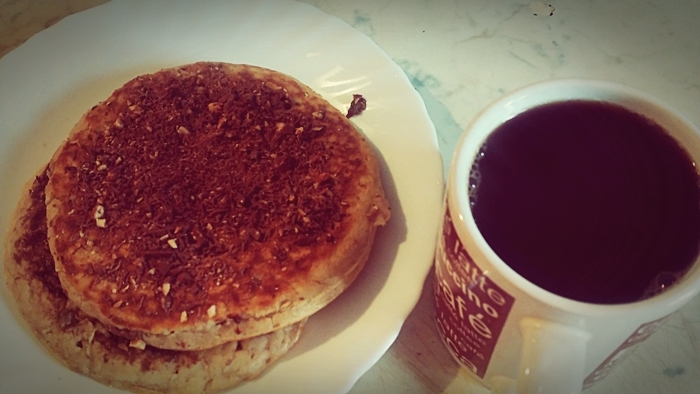 I made some eggless pancakes for breakfast today, topped with melted chocolate plus an ingenious brew of coffee with a dash of ginger and cinnamon for that extra umphhhhh! 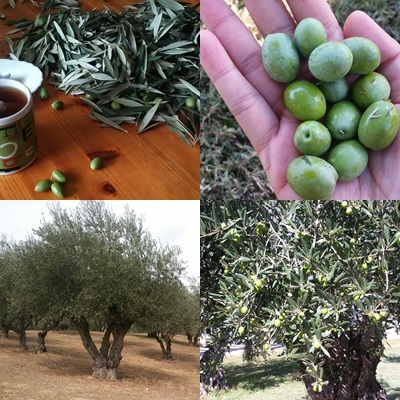 aroma to let the Feliz 2016 spirit kick in! Western breakfast for my husband as usual. I have made this eggless pancakes following the recipe from this site but slightly change it by adding a teaspoon of vinegar. Muy buen año para todos y adios!